Please read the introduction to this blog at Gateway to Kingdom. It gives the background. Why See? 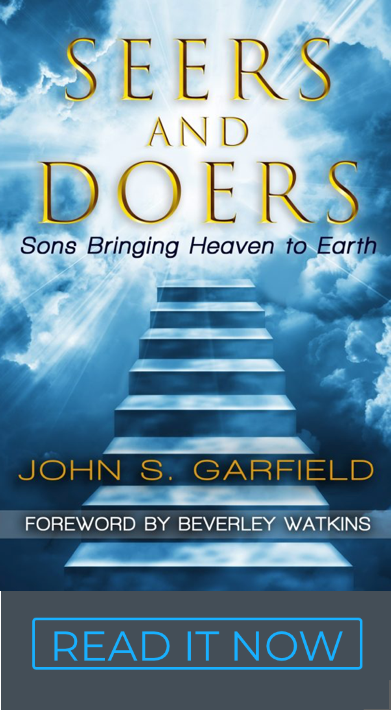 – God is teaching His sons to: 1) ascend, 2) see, and 3) loose what they see. It’s part of our Kingdom mandate to make a practical difference on earth. Our tradition is that God’s presence and anointing comes to us, but this shift is all about us appearing before Him in the courts and councils of heaven. Many are hearing this invitation to play their role in a reformation of nations by connecting the dots with their own “seer” gifting. You and I are invited too. It leads to “doing” what the father is doing. It’s not doctrinal or demanding. It’s a transforming experience with Jesus that is alive and fun! For a season, some will write this off as mysticism (just like tongues, prophecy, healing and deliverance). But one day the fruit, the overwhelming acceptance and the Biblical basis will be too much to criticize and then we’ll all be seers and doers. Father is inviting us to “come up here” and “appear” before Him and “see” what He is doing . . . Now! Why #2 – God does speak to us. Hearing Him is fundamental to maturity and effectiveness. God also wants to show us things. Seeing actually creates a much deeper impression on our hearts. Pictures and visions are the language of our hearts much more than words and concepts. Hearing is an understanding; Seers have an experience.
. . . Pictures and movies are the language of hearts; we record experiences! Yes, but how – Jesus said whoever looks at a woman lustfully has committed adultery with her already in his heart (Mt 5:28). Our imagination has the power to conceive sin. In the same way we can use our imagination to conceive the Kingdom. Just as lust or covetousness is evil thinking or vain imagination, imagination is part of the positive “conception” in the spirit (birthing). It has power to birth good or evil. Faith is the substance/evidence of things that cannot be seen in the natural. Faith is simply “seeing” things in the spiritual realm. When we see something in heaven, it helps us know that it’s real and we can loose it on earth. Imagination is a trigger to help us see in the spirit. It’s a big hurdle for all of us, but we have to give ourselves permission to “imagine” to kick-start seeing in the Spirit. Your imagination is a trigger for your sight. Give yourself permission and focus and time to see in this dimension. Learn to “watch” and be a “watcher.” Expect to see, have an experience and put it into action. Here’s how I explain it. When we were first baptized in the Holy Spirit and pray in tongues, someone prayed with us. They usually prayed in tongues with us and invited us to receive. Most of us had to be told just to begin to speak and not judge it. Our minds told us it wasn’t real, but over time our hearts knew that it was real, and we felt edified by it. When we first prophesied there were thoughts we felt were from God and “on the fly” we had to judge them, get them into words, and hope for the best. After a few amazing confirmations from other people and our own hearts, we were off to the races. It doesn’t get easier, but we are not intimidated by the degree of difficulty–it’s fun, it blesses people and we know when we nailed it by how it feels or sounds in our hearts and how it affects the person we minister to. Michael Heiser’s book (The Unseen Realm), was my biggest encouragement to “ascend” and “see.” We, as sons of God, were intended for that role–all creation is waiting for us. Seeing that clearly in scripture from a theological perspective was a huge release. Summary here. The second encouragement was praying with people in the courts with Beverley Watkins. She is a fluent “seer” and we spent one and half hours each with about 25 friends over the last two years, starting with me. This experience in the courts helped take the scales off my own eyes. The impact on lives loosened my reservations until I hungered to operate in the seer realm in my own right. A Taste – I consider myself a toddler at seeing. But by way of illustration this an example of something I “saw.” You are welcome to discern it for yourself. It encouraged my heart. I was in Israel, on my way up a long dry valley to Jerusalem – which I understood to mean on the way to my destiny; to the Father. I had packed up all my provisions to make the trip and had run out of food and water. It was hot and dusty, and it became obvious that I wouldn’t make it. I could feel death coming over me. There was no pain or fear, just the reality that I didn’t make it. In heaven there was a conversation in the control room or throne room. Angels said, “Wow, he made it farther than we thought he would.” I had the same sense of watching from heaven and seeing “me” not make it. An angel flew down and without even stopping picked me up like an eagle grabbing a rabbit from the jaws of a fox (saw this video the same day). He carried me up the valley and into the city. The city was the throne room (the council). The Father embraced me and said, I am your provider. Start every journey “before me” in this place. You have heard, now I want you to hear and see. You are no longer blind. I looked back down the valley from heaven; the desolate trail was now a highway that led into heaven. I knew I would be appearing in heaven and traveling that highway often. Ps 84:1-7 – How lovely are Your dwelling places, O Lord of hosts! My soul longed and even yearned for the courts of the Lord; My heart and my flesh sing for joy to the living God. The bird also has found a house, And the swallow a nest for herself, where she may lay her young, Even Your altars, O Lord of hosts, My King and my God. How blessed are those who dwell in Your house! They are ever praising You. Selah. 5 How blessed is the man whose strength is in You, In whose heart are the highways to Zion! Passing through the valley of Baca they make it a spring; The early rain also covers it with blessings. John, I am bringing you through this valley to pluck you out of your fire. You will experience my provisions as you experience me. Appear before me, dwell with me, ask of me, “see” with me. None of the desires of your heart we’re/are wrong, you just need to graduate from walking to flying; a different level of my sufficiency/grace operating through you. The breaking of your heart in Baca has released a fragrance that others can smell. Springs are now flowing in words and pictures. I have put in your heart the highway to Zion and you will invite others on this path. I will release provisions for your journey as you appear and ask and “loose” them. Be diligent about appearing before me in my councils/courts. You are doing well son. Leaning in – This idea of accessing heaven is not new; it’s normal and necessary to bring the Kingdom of God to earth. Lean into this; receive it for yourself. Matt 11:12 – “And from the days of John the Baptist until now the kingdom of heaven suffereth violence (lean into or be seized by it), and the violent (energetic) take it by force” (Catch up G726). G726 – harpazo (har-pad’-zo); from a derivative of NT:138 (prefer, to take for oneself); to sieze (in various applications): KJV – catch (away, up), pluck, pull, take (by force). The same word, harpazo (caught up) is used a dozen times. It speaks of initiative, hunger for heaven. We usually think of Philip being caught away or Paul being caught up as passive experiences where they just happen. But harpazo suggests something softer than take it by force, yet it’s still something we prefer or seize. Childlike hunger and simplicity are necessary ingredients for Kingdom. You and I simply have to want to visit heaven and see. It’s an invitation to an experience. Come up and see – Notice the connection (same Greek word, G305 anabaino) between our minds conceiving or imagining something (1 Cor 2:9) and the invitation to “come up” to heaven and “see” in Rev 4:1. The same word is used to describe Jesus ascending or going up to a mountain to pray (not a metaphor), He went back and forth from heaven, so should we. Imagination is a prerequisite for ascending. G305 anabaino (an-ab-ah’-ee-no); from NT:303 and the base of NT:939; to go up (literally or figuratively): KJV – arise, ascend (up), climb (go, grow, rise, spring) up, come (up). Wow you just made my day because this is what I asked God that He will reveal it to me that about other people saying I am busy with new age, but I am not.